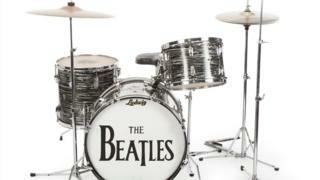 A drum kit played by Ringo Starr on Beatles hits including Can't Buy Me Love and I Want to Hold Your Hand has sold at auction for $2.1m (£1.4m). Last month, Julien's Auctions sold a drum head from a kit Starr played on US television show The Ed Sullivan Show in 1964, also for $2.1m. Also available is a guitar used by John Lennon, which he gave to Starr in 1968, some of the drummer's signature rings and his own copy of The Beatles' White Album, marked as number 0000001. The auction runs from until Saturday in Beverly Hills and also online via Julien Auction's website.